Vueling is a dynamic and innovative airline based in Spain. Vueling flies to over 100 destinations covering the main cities in Spain, Europe, North Africa and the Near East. Vueling wants to be an airline with friendly people and with the conviction that there's always room for improvement. Vueling offer history Apr	2017 Jul	2017 Oct	2017 Jan	2018 Apr	2018 Jul	2018 Oct	2018 Jan	2019 Apr	2019 Discount Code €10 off Vueling round trips with discount code! 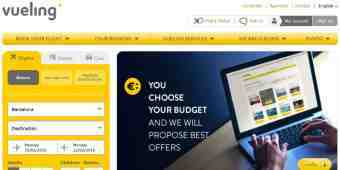 Offer Search flights by budget at Vueling! Search flights according to your budget at Vueling! Vueling Price Calendar - Search flights by price and date!